Stems: Erect, simple or sparsely branched above. Plants glabrous or sparsely puberulent, not glaucous; sap milky. Leaves: Mostly alternate or nearly opposite; petiole absent; blade linear, 2.4 to 8 inches long, .04 to .12 inch wide, tip gradually tapering to a slender point. 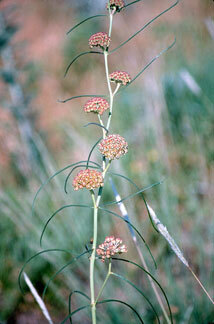 Inflorescences: Umbel-like cymes, 3-15, terminal and axillary, 10-35-flowered. Flowers: .28 to .4 inch long, .2 to .35 inch wide; calyx lobes 5, lanceolate to ovate-acuminate, .08 to .16; corolla pale green tinged purple, lobes 5, reflexed, elliptic-lanceolate, .18 to .25 inch; hoods 5, green or yellowish green, strongly ascending, .09 to .13 inch, margins with a pair of longitudinal flaps, apex truncate or notched; horns absent; gynostegium short-stipitate, .08 to .1 inch tall, .12 to .14 inch wide. Fruits: Pods, narrowly spindle-shaped, 3.2 to 4.8 inches long, .5 to .7 inch wide, smooth, glabrous or puberulent; seeds obovate, .28 to .35 inch; tufted with white to tan hairs, 1.2 to 1.6 inch. Habitat: Rocky to sandy mixed-grass and shortgrass prairies. Comments: Named for American botanist George Engelmann.